Mrs. Nicholls stands out as one of the most preeminent women in the world of art at the turn of the century. She has taught art, written art, and is famous for her work. 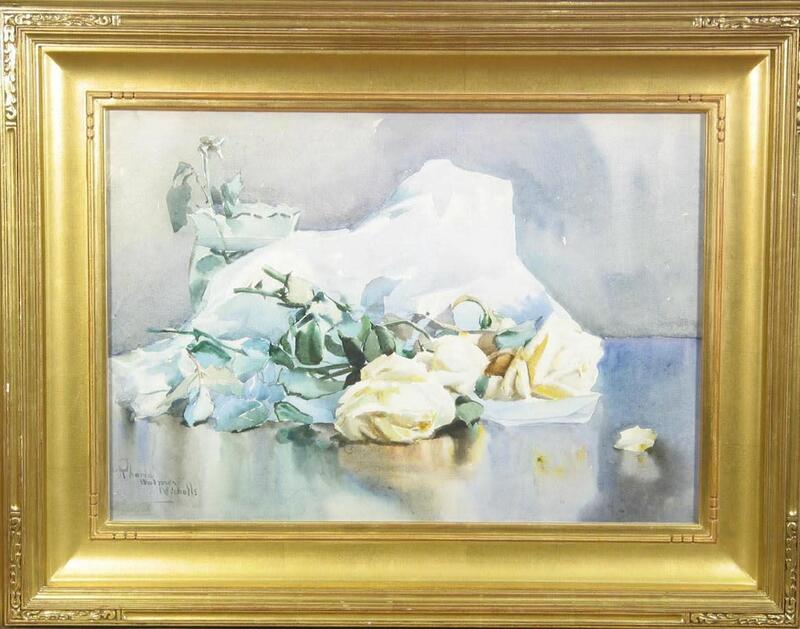 Mrs. Nicholls excels as a water color artist, although she has won prizes in oils as well. She has painted figures, flowers, landscapes, and portraits in water colors and oils. One large oil took a gold medal at the Prize Fund Exhibition in New York and another of an "Ostrich Farm" took a silver one at Nashville. One of her most famous works is a water color, "The Scarlet Letter" which took a bronze medal at the World's Fair at Chicago. Mrs. Nicholls has exhibited in Rome, Turin, Munich, and London, in addition to many American exhibitions. As a teacher of art she had been in high demand. At one time she conducted classes weekly in Hartford, Philadelphia, and Poughkeepsie, pupils even coming from as far as Canada to study under this celebrated instructor. Mrs. Nicholls was also well-known as an art critic. She had been at various times on the staff of Art Interchange and Art Amateur and was at one time co-editor of Palette and Brush. Rhoda Holmes Nicholls, was born in Coventry, Warwickshire, England, March 28, 1854, and came to this country in 1884. She is the daughter of the late Reverend William Groome Holmes, vicar of Littlehampton, on the South Coast, and his wife, Marian Cooke Holmes. In her seventy-sixth year, Marian Cooke Holmes made the long, tiresome trip from her home in South Africa to visit her daughter, Rhoda, in America. Something of that intrepid pioneer spirit she had passed on to that daughter. Rhoda Nicholls' first experience with any school was at the age of ten when she was sent to boarding school at South Kensington, where she remained until she was sixteen. Mrs. Nicholls says in speaking of this time: "I had not so much talent as a love of beauty which made me wish so to achieve that I began to achieve." By this time she had definitely decided to become an artist; she entered the Royal Female School of Art, Bloomsbury, and had to make the daily trip from Chesnut, where the family was then living. This, the gentlemen of that day considered very unusual. Mrs. Nicholls says: "I hate to do anything unconventional but sometimes you must. I never heard until afterwards that I had been talked about." But Mrs. Nicholls was never of the weaker fiber of mortals that lets foolish conventions stand in the way of real achievement. When Rhoda Holmes won the Queen's Scholarship she felt herself justified in her defiance of conventions. The Duke of Edinborough presented her with the Scholarship. He was the second son of Queen Victoria and at this time about thirty years of age. For days the excited young woman practiced going down one or two steps backwards, with an audience of admiring and envious fellow artists to criticize her facility and appearance. The Scholarship was a gift of fifty pounds for three years, quite a sum, two hundred dollars, for those days and in the English country. Her cup of joy was filled when Queen Victoria bought one of her studies. It was a great honor for the young aspiring artist. During this period she studied also for a short time at Heatherlys and the Slade School of Art. When her father died, her mother left for South Africa to join her four brothers, who one after another had gone out to engage in ostrich farming. Miss Holmes continued her studies in London, going to live with a chaperone, Miss Smythe, on Keppel Street near her school. When the opportunity came to visit Italy with six other girls and the superintendent and to study in the galleries, she eagerly joined them. This was her first taste of Italy and she soon made up her mind to throw over the two years of her scholarship and live in Italy "the artist's paradise" where she could make the money left to her by her father go much farther than in England, and at the same time keep up her studies in that inspiring country. With her aunt and uncle she visited the Paris Exposition of 1870. She traveled in Switzerland and northern Italy and then they took her to Rome and left her at Miss Meyer's School. Miss Meyer also chaperoned a number of art students, English and American. She studied landscape with Cammerano and landscape with Vertunni in the Via Margutta and water color with Signor Carlandi. She also studied in the evening classes of the Circolo Artistico. In the summer, a party of six went to Venice and with some Americans took an apartment in Via de Leone; from Venice, for two months, in the Dolomites, near Pieve di Cardore. The next winter she again returned to Rome. She studied in the Circolo Artistico in the evenings and was made a member of the Societe Degli Acquarellisti. In Rome, during the winter of 1881 she exhibited one work and received special compliments from Queen Marguerita. Thus the young artist honored twice by queens. Mrs. Nicholls mentions with pride that she was granted an audience with Pope Leo XIII, who blessed her and her family at a most impressive function. Some of the people were deeply affected at the solemn ceremony. Miss Holmes also sang in the choir of the American Church for a time, with the other students. Her first commissions for pictures came in at this time from Sir Richmond and Lady Cotton, who had entertained her for months at a time, making her one of their very lively large family. The pictures were to be Sunrise on the Campania and Sunset on the Campania. For the first she went with one of Miss Meyer's students to the Aqueducts. An Italian offered to accompany her to paint the sunset from Ponte Mole because he said it was not safe for a girl alone. She heard afterwards that she had been much criticized, greatly to her surprise, for she had been told that, while it was deemed improper for Italian girls, it was not unusual for English girls to do as they pleased. The first summer a party of girls went from the school to Venice and Perve di Cardore in the Dolomites and returned to Venice for a winter's work. In 1881, Miss Holmes' brother, Alfred, wrote that he was coming to England to take her to South Africa. They started in January and she was gone almost a year. This stay in Africa was a wonderful experience—so different from anything that she had ever seen before. Mrs. Nicholls declares that never shall she forget her first view of the Great Tearroo. The clearness of the atmosphere and the surprising distance one can see reminds her especially of the West of our own country. Her brother's farm was 26,000 acres with an old Dutch homestead, a mile from Kendrew Station and named after it. The farm was 150 miles from Port Elizabeth, the natural home of the ostrich, of which there were thousands. The ever enterprising Rhoda Holmes, not to be outdone by her brothers, bought fifty ostriches, which paid her well for several years. Her family seemed to take to that open air life quite naturally, even her mother. The Sunday River passed close to the house and her brothers had built weirs. Later on her brothers sold the whole property, which was made up into a town and college for teaching young colonists. Miss Holmes, with her inexhaustible enthusiasm, painted most of the time she was there. A new range of subjects and a different new horizon opened fresh interests for her brush. At the end of the year she returned to England. After a year and a half spent in recuperating from a bad accident on shipboard coming home, she was delighted to find herself in Venice again. One of her Venetian oil paintings, The Old Well at the Kirsch with a "monk collecting clemoryna" had been hung at the Royal Academy and a water color at the Dudley Gallery. Both were sold. It was in Venice also that Miss Holmes met another American painter, Burr H. Nicholls, who had been living in Brittany a number of years. They became engaged in six months and she went to England to buy her trousseau. They were married at Miss Holmes' uncle's house in Brookfield at Lyminster Church in Sussex and immediately sailed for America. They took a studio at the Sherwood Building, in New York, and there her daughter was born, three years after. A son was born a year and a half later in Ellenville, New York, a beautiful spot, but the English woman suffered with the miserably hot weather. Mrs. Nicholls likes to speak of these first years in America; how from the first she met with a broad and sympathetic understanding and helpfulness, and her pictures were given great consideration and always well hung. Later on she rejoiced to find a cool, beautiful spot, East Gloucester, then comparatively little known but rather built over and spoiled now. She spent many years in Gloucester and had large classes there, pupils coming from all over the country. In fact, Mrs. Nicholls laments the fact that she was obliged to spend the best years of her life teaching in order to support her family. From the time her daughter was born she began teaching in her studio. Also in the summers which were spent at Ellenville, Gloucester, Kennebunkport, and Oguonquit, she conducted large classes. For several years she went once a week to Philadelphia, Poughkeepsie, and Hartford to conduct classes. For three years she had the water color classes at Shinnecock, while Mr. Chase taught the oils. During all these years she only went twice to England; once alone for six months and once taking her children and visiting old friends. In 1915, Mrs. Nicholls rented her apartment and went to California, visiting first the Grand Canyon and then San Francisco, and to the Panama Pacific Exhibition where she had a water color exhibited. She found parts of the exhibition inspiring, especially around the Temple of Arts, and worked day and evening. Staying at the Inside Inn, she found very convenient. After the Exhibition closed she went to San Diego and stayed there four months at the Florence, making many studies of the lovely exhibition there. Some of these paintings she exhibited in the Arts Building before leaving. She visited Pasadena, Santa Monica, Los Angeles, Santa Barbara, and back to San Francisco. A very sad sight she found the Exposition, as if another terrible earthquake had passed. Fortunately, when the Exposition was broken up, the Temple of Arts was spared and there she passed her days painting and studying the fine show of pictures. On her homeward way she journeyed by way of Seattle, Puget Sound, Vancouver and the Canadian Rockies. Mrs. Nicholls enjoyed beyond measure the journey north, following a perpetual spring. To her artist eyes it was a marvelous experience, a journey of constant and varying beauty. Of the pictures painted on this journey west many were sold. A picture of the Horticultural Building was hung in the National Academy. Mrs. Coonley Ward bought one for her museum at Wyoming. At a prominent art gallery in San Francisco, an exhibition of Mrs. Nicholls' works was held. Late in her life, Mrs. Nicholls reveled in doing just what for years she had longed to do. With some artist friends, she took some models to a forest back in the Adirondacks, near Elizabeth, a town five hundred feet above sea level. Here she was entirely free and painted all summer with no pupils to interrupt. She painted more pictures than she had done in ten years while there were pupils to claim her attention. In addition, all these years Mrs. Nicholls was writing for the art magazines. She was at times art editor on the Art Interchange and Art Amateur, and at one time co-editor of Palette and Brush. For some time she took Saturday classes at the Art Students' League and after that at the School of Applied Design. She helped illustrate Howell's Venetian Life jointly with Child Hassam and Hopkinson Smith and painted pictures for advertising. Today her works are hard to come by and very rare even though her credentials far outweigh those of many of her contemporaries. 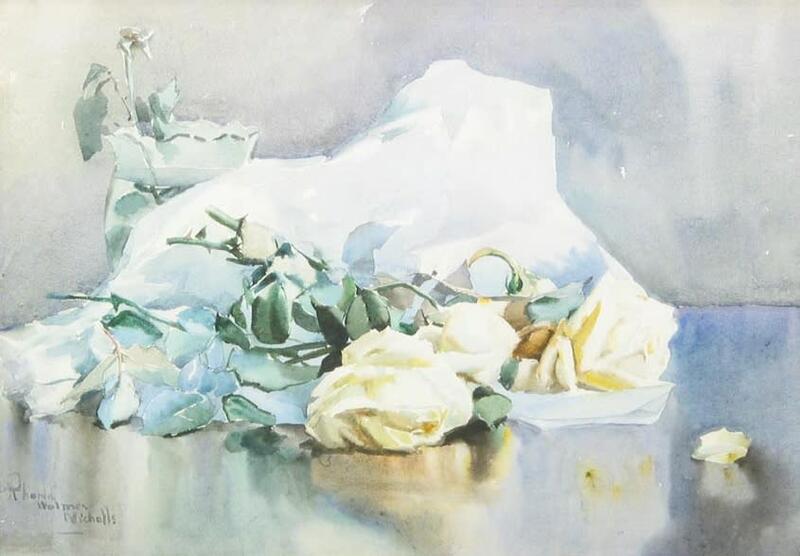 Feasts for the eyes, Rhoda Holmes Nicholls' paintings of roses are visual delights. Still life has been described as "the chamber music of painting, a singularly pure and refined form of aesthetic expression." (Wolfgang Born, Still Life Painting in America, 1947). Nicholls presents a feast for the eyes with these paintings of familiar objects that are a spectacle of pleasure. Her artistic ingredients of shape, color and light, are harmoniously arranged. Her approach with the medium is virtuosic in its delicate portrayal of the subject matter. The stunning flowers are absorbed in a luminous atmosphere; the artists' concern is with its fragile vitality. Rhoda Holmes Nicholls was so highly regarded for her work in watercolor that William Merritt Chase chose her to be his assistant at his Shinnecock Summer School of Art in Southampton, Long Island. He taught the oil painting classes while she was in charge of the Watercolor lessons.